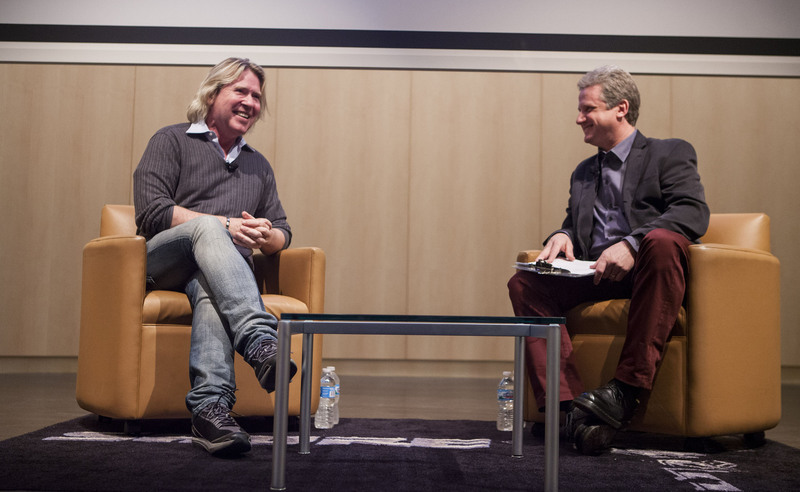 Pictured L-R: Multi-GRAMMY®-winning producer Steve Lillywhite and Shure's senior director of Global Brand Management, Mark Brunner, at GRAMMY SoundTables® "Behind the Glass with Steve Lillywhite" in the Chicago area. Photo Courtesy of The Recording Academy®/Barry Brechisen/WireImage. © 2014. Photographed by: Barry Brecheisen/WireImage. Pictured L-R, foreground: Carlos Alvarez and Eric Schilling, at "From Mic to Mix," part of "Listen Up! with HARMAN Professional," at Noisematch Studios in Miami's Wynwood Arts District, on Thursday, May 29, 2014. Photo Courtesy of The Recording Academy®/John Parra/WireImage. © 2014. Photographed by: John Parra/WireImage. Panelists gathered for the 14th Annual Pacific Northwest (PNW) Studio Summit at the EMP Museum's JBL Theater, presented by The Recording Academy Pacific Northwest Chapter in association with EMP (Experience Music Project) Museum, on Saturday, May 31, 2014. Photo Courtesy of The Recording Academy®/Mat Hayward/WireImage. © 2014. Photographed by: Mat Hayward/WireImage. SANTA MONICA, Calif. (June 13, 2014) — As part of ongoing initiatives regarding sound quality, studio methodology and professional development, The Recording Academy® Producers & Engineers Wing® and regional Recording Academy Chapter offices have hosted a jam-packed itinerary of events and forums throughout spring 2014, with many more scheduled throughout Q3 and beyond. On Thursday, May 15, 2014, the Academy's popular GRAMMY SoundTables® was brought to Chicago with "Behind the Glass with Steve Lillywhite," an intimate conversation with the multi-GRAMMY®-winning producer. Shure's senior director of Global Brand Management, Mark Brunner, led the discussion, during which five-time GRAMMY-winning producer/engineer/mixer Steve Lillywhite shared stories with the audience from his humble beginnings during the '70s punk rock and new wave movement in England to his rise as one of today's most in-demand producers, having worked with the Rolling Stones, Talking Heads, Dave Matthews Band, Peter Gabriel and Morrissey. Lillywhite reminisced about working with an Irish band that piqued his interest despite a badly recorded demo and how his collaboration with the band, which became known as U2, skyrocketed his career. Lillywhite also spoke on his non-traditional approach as a producer, advising the room that there are no rules when it comes to making records, with one exception: "No food in the control room!" In Miami on Thursday, May 29, 2014, the P&E Wing and the Florida Chapter hosted "Listen Up! with HARMAN Professional," featuring "From Mic to Mix" with Eric Schilling and Carlos Alvarez at Noisematch Studios in Miami's Wynwood Arts District. The event was co-sponsored by GC Pro, the outside sales division of Guitar Center that focuses on the needs of professional users. Attended by members of the Florida Chapter and The Latin Recording Academy, the event treated attendees to live recording demonstrations with the versatile and highly-respected Cuban artist Aymee Nuviola. Nuviola and her 11-piece band performed two songs, showcasing her stunning vocals and the talents of the accompanying musicians using AKG microphones and headphones. In the control room, playback was heard on JBL M2 master reference monitors, and signal processing consisted of Lexicon PCM hardware and software. Alvarez and Schilling explained microphone and recording techniques and ended with a Q&A. Also on site to answer questions were GC Pro representative Ricardo Jimenez, JBL professional director of Broadcast & Recording Peter Chaikin and AKG USA product manager Joseph Wagoner. 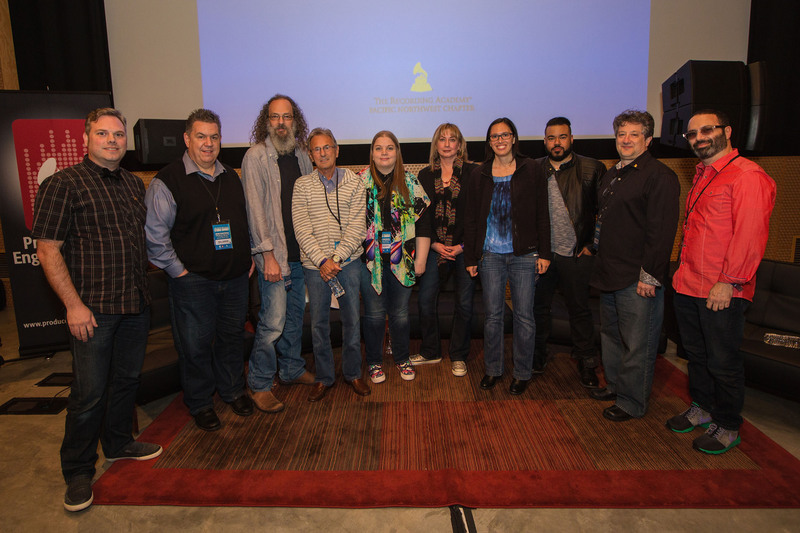 On Saturday, May 31, 2014, The Recording Academy Pacific Northwest Chapter in association with EMP (Experience Music Project) Museum presented the 14th Annual Pacific Northwest (PNW) Studio Summit at the EMP Museum's JBL Theater. Taking place from 10 a.m. - 5 p.m., the summit included GRAMMY-winning engineer/producer Andrew Scheps's acclaimed "Lost In Translation" presentation, along with interviews with Ann Mincieli, engineer and owner of NYC's Jungle Studios; songwriter/producer Erik "Rook" Ortiz from the production team J.U.S.T.I.C.E. League; and 21-time GRAMMY® Award-winning (and two-time Latin GRAMMY® Award-winning) engineer Al Schmitt. Photo Caption 1: Pictured L-R: Multi-GRAMMY®-winning producer Steve Lillywhite and Shure's senior director of Global Brand Management, Mark Brunner, at GRAMMY SoundTables® "Behind the Glass with Steve Lillywhite" in the Chicago area. Photo Courtesy of The Recording Academy®/Barry Brechisen/WireImage. © 2014. Photographed by: Barry Brecheisen/WireImage. 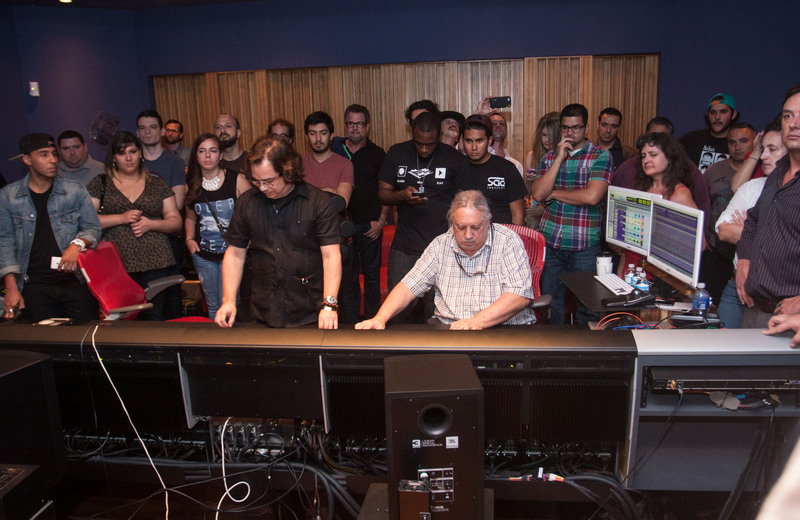 Photo Caption 2: Pictured L-R, foreground: Carlos Alvarez and Eric Schilling, at "From Mic to Mix," part of "Listen Up! with HARMAN Professional," at Noisematch Studios in Miami's Wynwood Arts District, on Thursday, May 29, 2014. Photo Courtesy of The Recording Academy®/John Parra/WireImage. © 2014. Photographed by: John Parra/WireImage. Photo Caption 3: Panelists gathered for the 14th Annual Pacific Northwest (PNW) Studio Summit at the EMP Museum's JBL Theater, presented by The Recording Academy Pacific Northwest Chapter in association with EMP (Experience Music Project) Museum, on Saturday, May 31, 2014. Photo Courtesy of The Recording Academy®/Mat Hayward/WireImage. © 2014. Photographed by: Mat Hayward/WireImage.